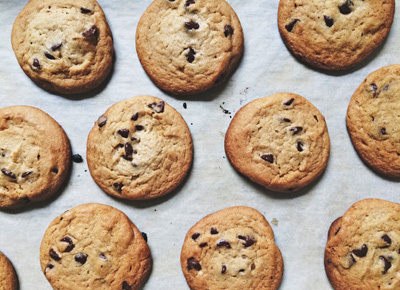 All you wanted was one piping-hot chocolate-chip cookie from scratch. But the recipe makes a dozen. And OK, you ended up eating four. Even still, you have eight cookies to save for later. Want to know the best way to preserve them in this original, glorious, chewy state? Here’s how. What you need: A Ziploc bag and a slice of bread (best if it’s just plain ol’ white but any variety will do). What you do: Once the cookies have cooled, place them in the plastic bag and toss the slice of bread on top. Then zip them up. Why it works: The bread contains natural moisture that the cookies will then absorb. That way they don’t dry out and turn into a crumbly mess so quickly. What you do now: Try your best not to creep into that Ziploc bag--for a few hours.